Two of Columbus’ most exciting jazz-fusion bands will perform on Thursday, January 10th at 9p.m. at the Columbus Rumba Café for a night of energizing live original music encompassing a fusion of Jazz, Latin jazz, Funk, R&B, and House music. This is the first time both bands have shared the same stage in one evening, but neither band is a stranger to the local music scene. Playhouse produces a truly original sound not heard anywhere else in the city and perhaps the state, blending House music with the improvisatory nature of jazz and a healthy dose of funky R&B grooves. Strong compositions and intelligent improvisation give this band a depth and range that is seldom seen. The two bands are rooted in the “groove” with heavy drum and bass backbones helping the soloists take the melodic and harmonic creations to creative new levels. Each band will feature the electrifying talents of Columbus based slide trombonist, Jason Branscum, one of the top call musicians in the city. Clave Sonic brings their high octane groove-based jazz set reminiscent of the sounds of Medeski, Martin and Wood meets Chick Corea and Stevie Wonder, mixed with the montuno and tumbao rhythms of early Afro-Cuban music. The Latin jazz influence in the band’s music comes from composer and pianist Dean Marcellana, who spent many years in the Boston area performing with some of the top jazz and Latin jazz musicians in the city. That experience paved the way for a variety of original compositions rooted in jazz and R&B, with a “Latin” feel, hence the band’s inclusion of “Clave” in the name. Clave is the traditional rhythmic pattern in Afro-Cuban music. 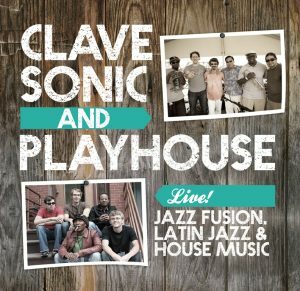 Clave Sonic and Playhouse perform live at the Rumba Café, Thursday evening January 10th starting at 9pm. Playhouse is lead by: Billy Zehnal on bass; Don Carlos on drums, beats, science; Jeffro Jam – moog, keytars, master of ceremonies and Jason Branscum – slide trombone.